Established in 1991, the Neponset Animal Hospital has been caring for all types of small animals, including dogs, cats, ferrets, rabbits, and birds. We’re located in the heart of Boston, and also serve Milton, Quincy, South Boston and other suburbs. As a full-service veterinary center with a team of friendly and knowledgeable veterinarians, veterinary technicians, and support staff we offer the highest quality care. Our team uses state-of-the-art equipment and administrative tools to help make each visit efficient, affordable, and pleasant. Our facility is ten thousand square feet, with a pet supply store, and a 2,500 square foot outside play yard in the heart of the city. We also service Milton, Quincy, South Boston and many other surrounding boroughs. We’re open 7 days a week and have plenty of off-street parking. Located at the southeast end of Dorchester, Boston’s largest neighborhood, we are easily accessible to many neighborhoods, towns and communities on the South Shore. Since 1991 our team of veterinarians, veterinary technicians, groomers, kennel and daycare attendants and support staff provide a positive experience for you and your pet. We utilize state-of-the-art equipment to examine, diagnose, treat and monitor the health and well-being of virtually all small animals, including exotic animals. Neponset Animal Hospital is a one-stop facility, combining the highest level of care with convenience, in a friendly and welcoming environment. Comprehensive veterinary services include all aspects of routine wellness care, diagnostics, spaying and neutering, and specialized medical care for dogs, cats, and other small animals. Professional grooming services keep your pet fresh and clean and help head-off health problems that often go undetected until your pet is showing serious signs of discomfort. Doggy daycare and boarding services give your pal safety, security and plenty of TLC, as well as provide the peace of mind that comes with knowing your pet is being well cared for in your absence. Our services are rounded out with retail shopping for all of your pet’s needs and wants, including premium pet food and treats, leashes, collars, pet beds, carriers and more; you can also order by phone and arrange for pick-up or home delivery. 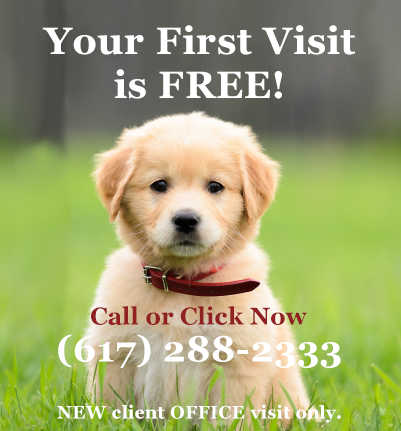 There are no routine procedures at Neponset Animal Hospital. Our team of doctors and surgical technicians provide an individualized anesthetic and pain management protocols for each pet undergoing surgery. For your pet’s safety, our operating suite is equipped with the latest in veterinary monitoring equipment including EKG, blood pressure, oxygen saturation, temperature, heart rate and respiration rate. All dogs must be fully vaccinated and checked for proper disposition and like size. Please call (617) 288-2333 to schedule an appointment. Our full-service boarding facility is conveniently open 7 days a week. Creating a safe and comfortable stay for your pet is our highest priority. Our highly trained and experienced staff, and our clean, secure, and climate controlled facility produce a stable environment that you can depend on, regardless of the length of your pet’s stay. We offer a variety of accomodation and budget options, with clean bedding provided on-site. Olaf’s getting into the Christmas spirit. Santa is coming to Neponset! Neponset Animal Hospital shared a video. Santa is coming to Neponset! Be sure to bring in your furry little friends for Santa pictures! Your pet’s health and comfort are our top priorty. Our veterianarians are members of the American Veterinary Medical Association (AVMA) as well as state level groups, such as the Massachusetts Veterinary Medical Association (MVMA). Our technicians receive comprehensive training to ensure the highest levels of safety for all of our patients. Continuing education in medicine and technology keeps both our veterinarians and our technicians up to date in the latest tools and methods to prevent, diagnose, treat and monitor routine and specialized medical conditions. Our vets, techs, and support staff form a team of professionals that are dedicated to your pet’s health. We strive to improve the quality of your pet’s life with open and frequent communication so you understand the situation at any given time as well as what to expect through the various stages your companion’s life. Caring for patients at Neponset Animal Hospital since 1999. Dr. Joanne Keith is a 1994 graduate of the Tufts University School of Veterinary Medicine. Dr. Keith can often be found walking in the area with her dogs, Chloe and Gina. Gina is the newest addition to the Keith family after the recent passing of Pudgie, her beloved dog. Outside of work, Dr. Keith enjoys many outdoor activities including swimming, kayaking and rollerblading. Caring for patients at Neponset Animal Hospital. A 1998 graduate of the Cornell University College of Veterinary Medicine, Dr. Henry has been practicing at Neponset Animal Hospital since 2001. She enjoys spending time with her growing family and her five pets. She also likes snowshoeing, reading and cooking.